Here is an important news for MBBS doctors seeking admission to MD/MS program through PGIMER Entrance for July 2018 session. Online Registration for MD/MS July 2018 session has now begun. 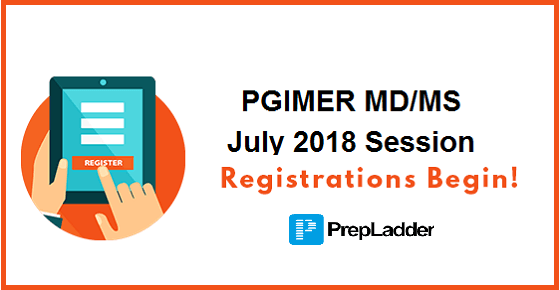 We will now familiarize you with the important information regarding PGIMER MD/MS Entrance for July’18 session. You can also read detailed category-wise seat matrix here. The candidates completing internship after 30 June’18 are not eligible for MD/MS, House Job courses. The number of seats are provisional and may increase/ decrease without any prior notice. The registration fees for PGIMER MD/MS July 2018 session is to be deposited in any SBI branch by filling the Challan form in the name of Director, PGIMER, Chandigarh in Power Jyoti Account No. 32211613319. The candidates who have SBI account can also pay their fees through i-collect service No. 32222954695. You can contact the Helpline Desk in case of any enquiry regarding MD/MS courses. Timings: 9:30 AM to 5 PM.